Most teeth that have had endodontic treatment can last as long as other natural teeth. Sometimes the infection is resistant and does not heal. Symptoms may develop months or years after the initial treatment. But, you still have a second chance to save your tooth. Endodontists are experts in solving these types of problems every day. They use special training and experience in treating difficult cases including cases when the infection has not resolved. Advanced technology such as an operating microscope, ultrasonics, and digital radiographic imaging are used alongside expert specialty training and clinical experience to solve these complex problems. Narrow or curved canals were not treated. Failure to remove all infection during the first procedure. Placement of crown or other restoration was delayed following the endodontic treatment. 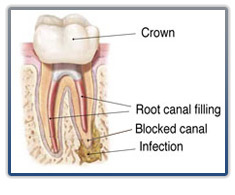 Crown or restoration did not prevent contamination to the inside of the tooth. 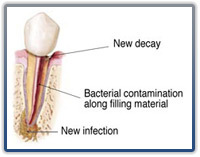 New decay under crown or other restoration allowing new infection in the tooth. Loose or damaged crown or restoration can expose tooth to new infection. Complex restorative materials — crown, post & core material — must be disassembled and removed to permit access to the root canals. After removing the canal filling, the endodontist can clean the canals and carefully examine the inside of your tooth using magnification and illumination, searching for any additional canals or unusual anatomy that requires treatment. After cleaning the canals, the endodontist will fill and seal the canals and place a filling in the tooth. After your endodontist completes retreatment, you may need to return to your dentist as soon as possible to have a new crown or other restoration placed on the tooth to protect and restore it to the full function. Endodontic retreatment and restoration of the natural tooth are less expensive than the removal of the tooth and an artificial replacement. Actually, the value of a natural tooth is irreplaceable. Most dental insurances policies provide coverage for endodontic retreatment. Intravenous Sedation is available in our office for the patient who desires to be sedated. Patients who choose Intravenous Sedation report an excellent dental experience and do not remember the procedure. Please see Sedation for more details about Intravenous Sedation.